(CNN) – Newt Gingrich will challenge his rivals for the GOP presidential nomination to a debate next week, the former House speaker said Monday. Gingrich said he expects to extend the invitation Tuesday for a forum in Mississippi or Alabama, where voters head to the polls on March 13. CNN LIVE:Go to CNN.com, and CNN Mobile for the CNN Election Roundtable, a live video chat hosted by Wolf Blitzer and the CNN political team, on Tuesday at 12 p.m. ET. Tune in this week for live coverage of the primaries on Super Tuesday on CNNPolitics.com, on the CNN apps and on the CNN mobile web site. Follow CNN Politics on Facebook and on Twitter at #cnnelections. "I think we owe it to the people of Mississippi and Alabama to have a debate," Gingrich said on Fox News. "I think that frankly it's to everybody's advantage to have a debate." He also used the impending invitation to single out Romney, the current Republican frontrunner. 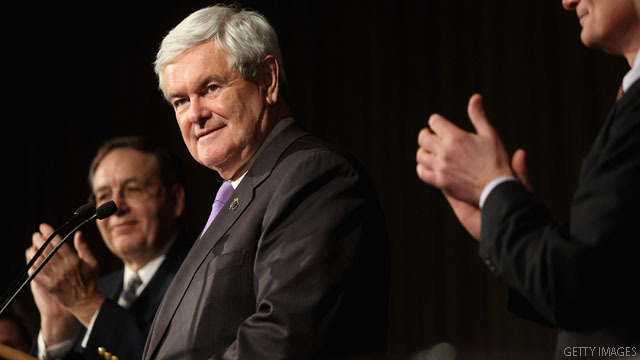 "I don't think Romney can just hide behind millions of dollars of paid ads," Gingrich said. "He's got to come out in the open." Gingrich, whose support in national polling has waned, experienced bumps nationally and state-wide following presidential debates earlier in the election cycle. The former Georgia congressman is hoping a win in his home state on Tuesday will propel his campaign toward strong showings in other Southern states. If the other candidates are smart, they will decline his invitation. His numbers will look worse and he will have no choice but to concede his imaginary run for the white house. He really should just concede now because I see no real feasible road to the white house for him. On Fox Snooze, Newt said, "I think that frankly it's to everybody's advantage to have a debate." Translation: I cannot stand on my own. Without the other candidates around, no one pays me any attention and could care less about my candidacy! He's hoping for a similar situation like when he attacked John King for asking what was on everyone's mind except the planted audience. This btw was the Grinch's only "debate" where he came out as the winner. But then, that was in the Carolinas, where men go hiking on the Appalachia Trial alone on Father's Day. And indeed, "If the other candidates are smart, they will decline his invitation." Besides, everyone's just about had it with these so-called "debates". He wants the hate-filled racist applause of those people. No more debate. Each time one there's a debate they, the repub candidates, look like children trying say "hey I hate obama more than you do" so vote for me. It's becoming sad.